If you work in a high-risk field of employment, it is likely your employer offers you a form of long-term disability insurance. However, long term disability insurance is an important component of all workplace accident and injury coverage. Because there are varying ways in which your employer can offer this type of extended care and protection, it is important that you understand how this coverage can vary. If you have been the victim of a serious injury at work, you may be able to claim benefits. Contact the Indiana long term disability lawyers of the Hankey Law Office, today at (800) 520-3633 to learn more about how an experienced attorney can help you file a claim for your long-term disability. When employers offer group long term disability coverage, it can be significantly cheaper for the employees. Group coverage plans are not individualized, which means rates and premiums will not be lowered or increased due to the employees’ age or gender. Having a group policy in place can streamline the compensation claim process. No matter what type of coverage applies to you, it is important that you seek legal assistance when filing a claim. 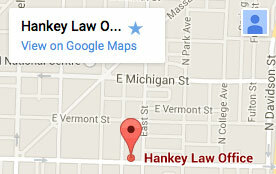 If you have been a victim of a work accident, the Indiana long term disability attorneys of Hankey Law Office, would like to help. Contact our office today at (800) 520-3633 to learn more about your legal rights from a knowledgeable lawyer.